I did get a 20gig ipod 4th gen. 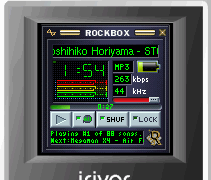 It has battery problems but took rockbox like a champ. Soon itll be getting a new battery and zif drive. There are a lot of really great MP3 players now. Fiio X1 is $100 and it is a great DAP. No itunes either. MP3 players were sort of a hobby of mine in the day. I recently got the X1 and it is pretty sweet. I have a Sony mp3 player and those are really great. Sony has really great sound quality for the price. iTunes on Windows is a mess, but iTunes on MacOS X is beautifully integrated into everything seamlessly. When I boot into OS X (most of the time) I’m very happy with iTunes; when I boot into Windows I don’t even keep iTunes installed on that partition. The Fiio line looks neat. I mentioned Apple, Fiio, and Sony MP3 players in this thread. My mom's still using a Sansa Clip+ upgraded to the latest original firmware with a 32GB MicroSDHC card. I've offered to upgrade it to Rockbox a couple of times, but she doesn't want to play Snake or Doom or mpeg video on it's monochrome oled screen, and doesn't even want any audio enhancements beyond the built-in EQ presets. Probably better battery life without the Rockbox firmware, but still, an MP3 player that can't play snake seems lacking IMO. ... The internal drive is only 4.8GB - kinda pathetic by todays standards, but still over 1000 songs at standard bitrate. It also plays most tracked and video-game ripped formats. Battery life is still great - I think 7+ hrs per battery last time I clocked it. I have 2 extra batteries somewhere that I refresh every couple of years. Since I have never used it in recent memory, it's yours for cost of shipping from BC Canada if ya want it.